This was our original import and we still keep a vast range of spares for them and we still keep buying and selling them too. We offer a complete range of accessories and extras to maintain and customise your CRM. Click on the images below to see a larger image, use the browser "back" button to return to this page. 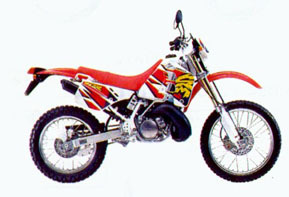 The Mk1 was the first CRM model produced in 1989/90 being styled to look similar to Honda's Moto-X bikes of the day with conventional front forks, Pro-link rear suspension and discs front and rear. Two stroke oil is contained in the front of the main frame prior to autolube injection. The engine output is around 37 BHP with a six speed gearbox. Fuel tank capacity is 10 litres with a reserve of 2.2 litres. Gross weight is 123 kg. Standard gearing is 14 tooth front sprocket & 42 tooth rear sprocket. The first model up-date for 1991/92 was Upside Down front forks, improved rear suspension and engine modifications for better torque. Brighter more colorful graphics were also added. Two stroke oil is still contained in the front of the main frame prior to autolube injection. 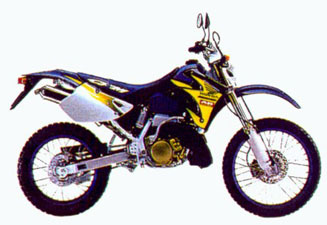 The engine output is 40 BHP with a six speed gearbox. Fuel tank capacity remains the same as does the gearing. Gross weight is 127 kg. 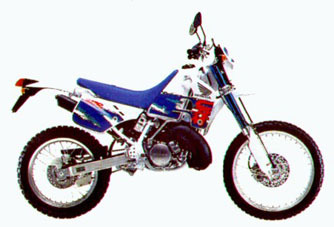 The Mk2/2 was the 1993 model with minor engine, suspension and chassis enhancements plus more colorful revised graphics. Complete chassis and bodywork up-date, consisting of new larger USD front forks, longer rear shock, a small increase in torque, stainless steel rear silencer, new more stylish plastics and graphics. Two-stroke oil is now in a separate reservoir. The engine output is 40 BHP with a six speed gearbox. Fuel tank capacity is 11 litres with a reserve of 2.5 litres. Standard gearing is 14 tooth front sprocket & 42 tooth rear sprocket. Gross weight is 127 kg. 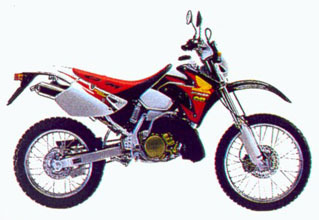 This model first appeared in 1994 and continued till mid 1997. Similar styling to Mk 3 but AR model has Honda's unique Activated Radical engine control system, this has the effect of producing excellent low rpm torque but at top rpm has the usual two stroke power. As a side effect of this system the AR is excellent on two stroke Oil and petrol consumption. The engine output is 40 BHP with a six speed gearbox. Fuel tank capacity is 11 litres with a reserve of 2.5 litres. Gross weight is 127 kg. Standard gearing is 14 tooth front sprocket & 42 tooth rear sprocket. Updated graphics and small improvements in brakes and suspension finish off the flagship of the CRM range.